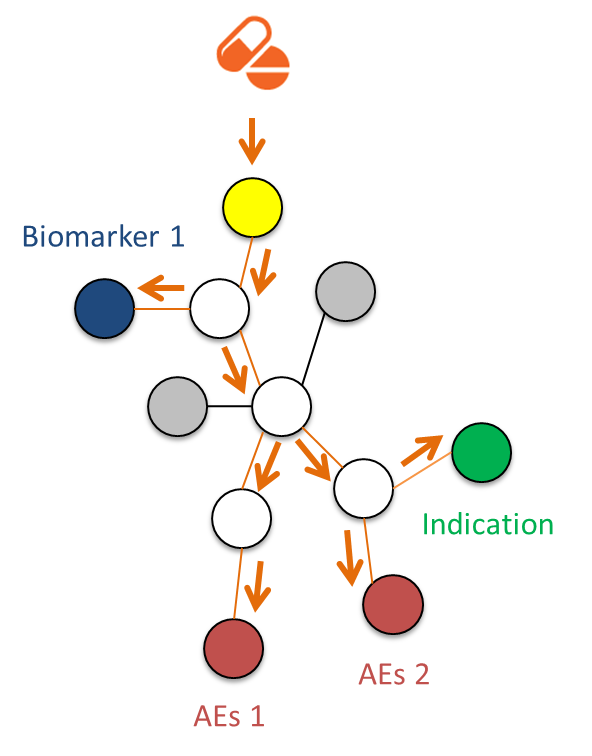 Signal flux from target (yellow) to clinical effectors (green/red) and biomarkers (blue). Proteins in grey are not affected, proteins in white are part of the mechanism of action and arrows describe the signal flux. 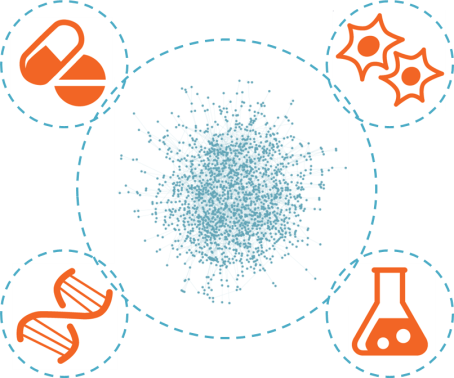 Anaxomics’ TPMS integrates all available biological, pharmacological and medical knowledge into systems biology models that simulate in silico the behaviour of human populations. In this manner, we can test and evaluate the physiological effects of any pharmacological compound at the molecular level, generating mechanistic hypotheses that are in accordance with nature. Systems biology envisages living beings as complex networks of genes or proteins that are linked by their known biochemical relationships. Any change in the biological system, such a drug treatment or a gene mutation, induces a “perturbation” that is transmitted across the network. By feeding the models with state-of-the-art scientific data, TPMS models how the signal flows and the clinical consequences of the perturbation. The most probable path connecting the altered protein, even if it is not a drug target, with the final physiological effects is termed Mechanism of Action (MoA). However, when trying to relate perturbations in the system to indications and adverse events, one key issue arises: clinical and molecular concepts belong to entirely different worlds. As a means to tackle this problem, Anaxomics has created a dictionary that translates clinical and medical terms into molecular biology data, thus effectively linking both worlds. The Biological Effectors Database (BED) contains more than 3500 proteins in 200 pathological conditions. Anaxomics’ databases contain manually curated information extracted from more than 15 000 scientific papers, as well as from widely acknowledged public and private databases.